Erich asked what kind of tea we drink. Tea is a subject dear to our hearts, so we thought we’d discuss it today. The critical step is fermentation, which oxidizes the leaf and turns it black. 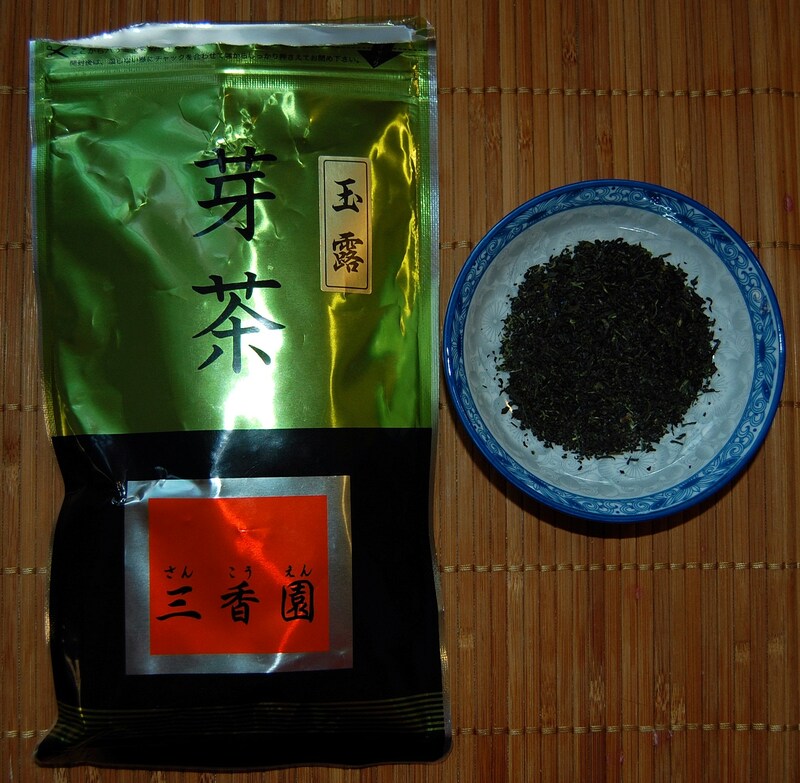 Green tea is unfermented; oolong (wu long) is partially fermented; and black tea (in Asia, “red tea”) is highly fermented. Black tea has a longer shelf life than green tea. Growing region matters. Mainland China is by far the world’s largest producer of tea, but China is extremely polluted and we would not trust Chinese tea. 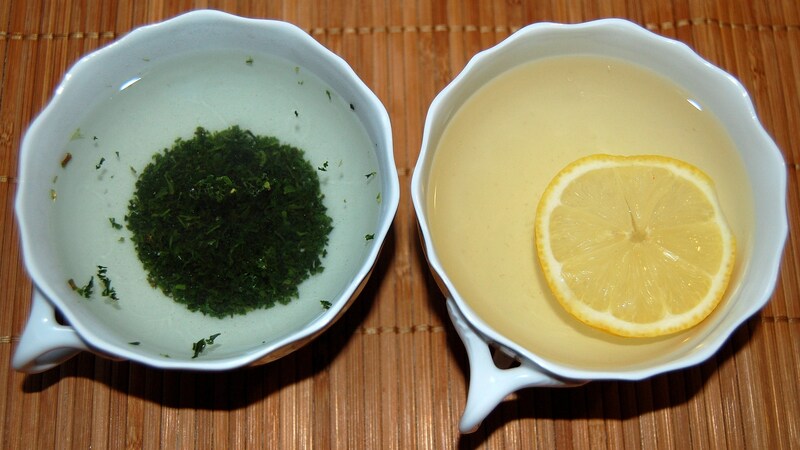 Japan and Taiwan both produce excellent green teas; we drink tea from both countries. The one on the left is green tea, the one on the right an oolong; both are “high mountain” teas. Each package weighs 300 g. We use about 4 g (20 leaves) of tea per day, and so a package lasts about 3 months. 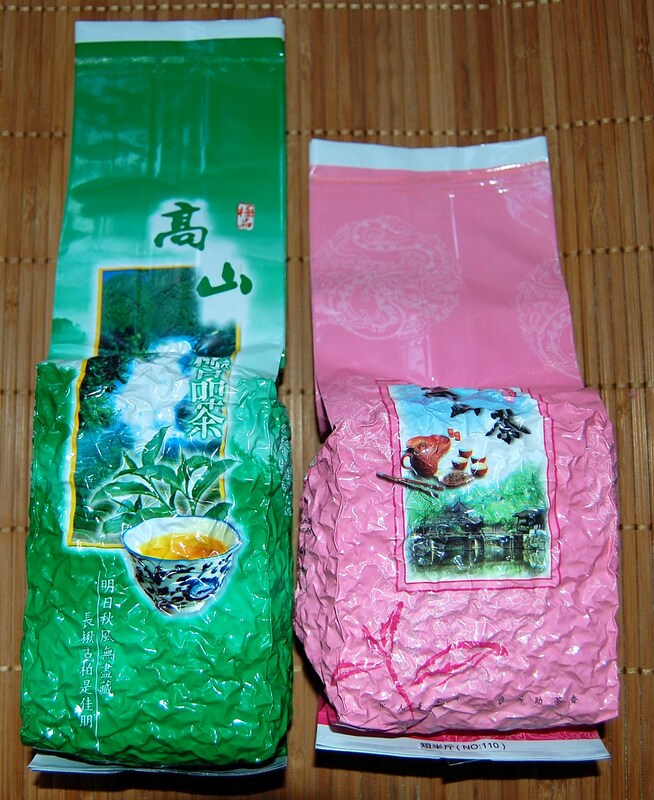 A single 300 g package of high quality tea may cost $100, so the total cost is about $1 per day; but multiple cups of tea may be obtained from each day’s tea. Left — rolled and dried leaves, ready to make tea. Right — an opened bud, after being used. The opened bud on the right gives you a good idea what the leaves look like on the tea tree. Workers pluck these small buds from the trees and place them in baskets; the finest buds are plucked early in the spring. For best results it’s important to use pure water. Tap water produces a discolored tea with a foul taste. 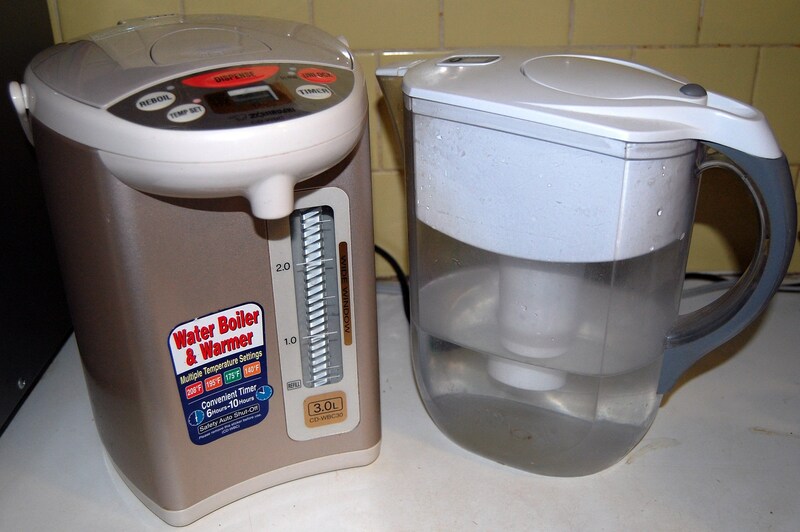 We get good results filtering our water in a Britta filter. In fact, we judge that it’s time to change the filter when our tea changes taste. The Britta instructions recommend changing the filter every two months, but we find it needs to be changed every month if our tea is to retain its flavor. Left — An Asian “busy person’s” tea-pot. 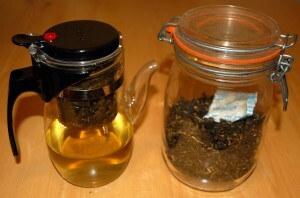 A container at top holds the tea leaves and enough water to make a single cup. When the leaves are done steeping, pressing the red button drains the water into the pot, after which it can be poured into a mug. Right — an airtight container we use to store our tea leaves. The tea leaves go in the removable upper part; when it is removed the tea drains through the holes in the bottom into the mug. 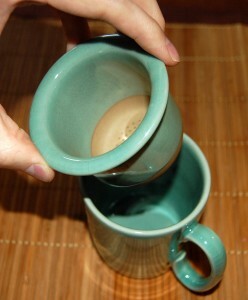 After drinking a cup, the upper container with the leaves can be put back in and more hot water added to steep another cup. 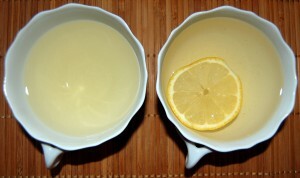 To make the tea, place 15-20 rolled buds into the leaf container, and add hot (near boiling) water. Taiwanese green tea typically requires 3 to 5 minutes to steep, and the tea is actually yellow, not green. We are regularly sent tea by relatives and friends in Asia, so we haven’t had to shop for tea in the US. Oolong Tea-Alishan High Mountain Tea,The Unique Local Climate and The Selection Criteria for Leaves Make Alishan Oolong Tea Rarity. 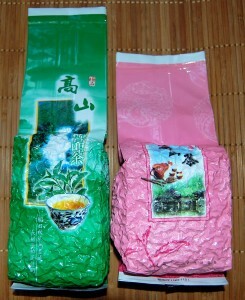 150g/bag Comes With Beautiful Tin Can.One of The Best Tea in Taiwan You Should Try. 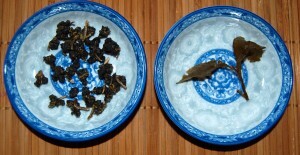 At roughly $1 per day, fine tea is not inexpensive. However, many people spend as much or more on coffee. Paul makes 5 or 6 cups per day from a single 4 g set of leaves, so the cost averages to only $0.20 per cup. If your only knowledge of tea is derived from the Lipton Tea Company, we very much recommend that you give fine green or oolong teas a try! You might find tea more pleasant and enjoyable than you imagined. 55-year-old Karen Byrne in New Jersey … suffers from Alien Hand Syndrome. Her left hand, and occasionally her left leg, behaves as if it were under the control of an alien intelligence. A number of studies have found protein to be the most satiating macronutrient, with fat moderately satiating, and carbs least satiating. Thus, when people reduce carbs and increase protein, their appetite declines and they almost always reduce calorie intake. This can leads to rapid short-term weight loss. This is why most popular weight loss diets are high in protein: increasing protein causes dieters to quickly lose some weight, encouraging them to continue. The higher than usually recommended protein content of many popular diets, such as the Atkins Diet, The Zone, and The South Beach Diet, seems to point at possible solutions to the obesity epidemic. Many national dietary guidelines have, until recently, recommended that only 10–20% of the calorie content of the diet come from protein; however, 30–40% of the calorie content in the aforementioned diets comes from protein, at the expense of carbohydrates. Newer research indicates that the high-protein content of these diets may actually be the reason for their partial success in inducing weight loss, despite no restrictions in total calories (2)…. In this issue of the Journal, Weigle et al (3) showed that an increase in dietary protein from 15% to 30% of energy and a reduction in fat from 35% to 20%, at a constant carbohydrate intake, produces a sustained decrease in ad libitum calorie intake and results in significant weight loss…. But there are downsides to high protein consumption. Various animal experiments have found that longevity is increased with protein restriction. Also, protein restriction promotes autophagy, which enhances immunity to intracellular bacteria and viruses. So higher protein intake may shorten lifespan and increase the risk of disease. In a post on his blog (linked in this comment), Dennis Mangan introduced us to the “protein leverage hypothesis.” This hypothesis is put forward in a 2005 paper by SJ Simpson of Oxford University and D Raubenheimer of the University of Auckland . 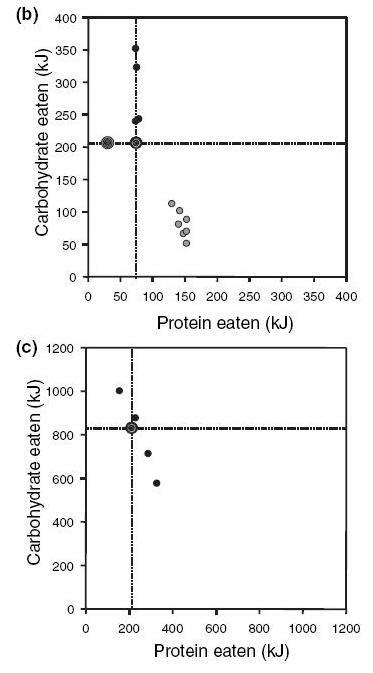 The paper has some graphs which neatly illustrate the satiating power of protein. When animals are given a food formula with a lower protein fraction, they eat more total calories. Here are some data from rats (b) and chickens (c). The numbers are in kiloJoules; divide by 4.18 to get calories. The animals were on feed formulas with a constant fat content, but different carb-protein ratios. Each data point represents a diet with a different P:C ratio. If both macronutrients were equally satiating, then the animals would eat the same amount of calories regardless of their food’s protein-carb ratio. The data points would fall on a 45º line (say, for chickens, a constant 1000-kJ line connecting the 1000 kJ mark on the y-axis with the 1000 kJ mark on the x-axis). But they don’t: if a line were fitted to these points, it would be much closer to vertical than 45º. 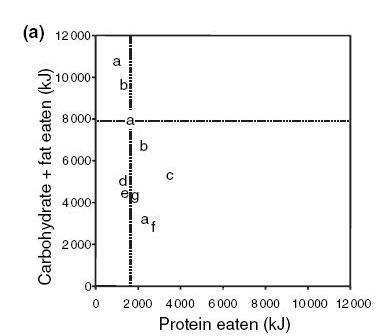 The rats, for instance, eat around 150 kJ protein and 75 kJ carb if given high-protein food, but 75kJ protein and 300 KJ carb if given high-carb food. That’s 225 kJ (54 calories) on a high-protein diet, but 375 kJ (90 calories) on a high-carb diet. A shortage of protein makes them hungry, and it takes a lot of carbohydrate to satisfy that hunger. So they eat a calorie excess. An excess of protein satisfies their hunger and causes them to quit eating while they are still in calorie deficit. Results a, b, and c are from “short-term” experiments that varied from 2 days to 6 months in length. Results d, e, f, and g are from “long-term” experiments. People tend to gravitate toward a protein intake of 1520 kJ (360 calories). This can be construed as the “normal” human protein intake, and tends to occur near a carb+fat intake of 8000 kJ (1900 calories). So the “normal” protein fraction of the diet is 360/2260 or 16%. This is consistent with epidemiological data, which finds that nearly everyone worldwide eats near 15% protein. A line fit to the data has the same steep slope as the animal experiments, but note something interesting. The short-term experiments have a very steep slope, but the long-term experiments have a slope much closer to 45º. This has to happen. Otherwise, a high-protein diet would lead to permanent calorie deficit which, over time, would lead to starvation. A low-protein diet would lead to permanent calorie excess which, over time, would lead to obesity. Since we know people neither starve nor become obese due to small adjustments in protein fraction, they must adjust their calorie intake. In the long run, protein no longer controls calorie intake. So there is great protein leverage in the short-term, but much less protein leverage in the long term. Simpson and Raubenheimer try to develop protein leverage into a theory of obesity. It’s not a very good theory, so I’ve relegated it to an appendix. Instead, I’d like to talk about what this satiating power of protein means for Perfect Health Dieters. We have a fairly broad healthy protein range, 200 to 600 calories per day, which brackets the “normal” protein intake of 360 calories. What happens if you shift from 360 calories protein to either the low-protein or high-protein ends of the range? At low-protein intake, your appetite goes up and total calories go up. You gain a little weight, in the form of adipose mass. This causes leptin levels to increase. As we discussed in “How Does a Cell Avoid Obesity?”, higher leptin (a) lowers appetite and (b) increases thermogenesis, or destruction of fat as waste heat. Adipose mass increases until the actions of leptin counterbalance the influence of protein leverage. You reach equilibrium at a slightly higher fat mass and slightly higher leptin levels than on the “normal” protein intake. At high protein intake, appetite goes down and total calories decrease. You start to lose adipose mass. This causes leptin levels to go down. This (a) increases appetite and (b) decreases thermogenesis, or heat generation. Adipose mass decreases until a new equilibrium is reached. Equilibrium is reached at a slightly lower weight and slightly lower leptin than on the “normal” protein intake. The main effect of changing the protein content of the diet is a modest change in body composition. High-protein diets make you leaner and a little lighter. Low-protein diets give you a slightly higher adipose reserve and make you slightly heavier. The effect is probably small; probably just a few pounds either way. But if you’re looking for to win a bodybuilding competition and you have to become extremely lean and “cut,” you’d do well to adopt a high-protein diet. I think Anthony has a healthy body, but I don’t think you need to be this lean to be healthy. He would be equally healthy with a few more pounds of adipose tissue. A more chiseled body. 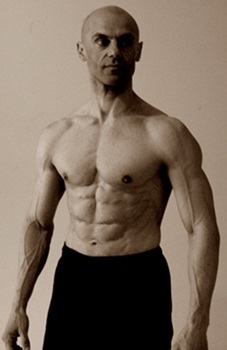 If you want a lean, “cut” look, like Anthony Colpo, high protein will help. A controlled appetite. In a recent post, Don Matesz stated that he liked a high-protein diet because it helped him auto-regulate his calorie intake. If your goal is “effortless” (willpower-less) calorie restriction, then high protein may help – at least for a while. However, there are reasons to restrict protein as well. Lower protein intake is likely to extend lifespan, and can increase immunity against intracellular bacteria and viruses, which are behind many late-life diseases. Is it possible to achieve a lean, muscular body while still gaining the longevity and immunity advantages of low protein intake? And can one lose weight comfortably without assistance from a high-protein diet? Those will be the topics of Thursday’s post. Astrup A. The satiating power of protein—a key to obesity prevention? Am J Clin Nutr. 2005 Jul;82(1):1-2. http://pmid.us/16002791. Simpson SJ, Raubenheimer D. Obesity: the protein leverage hypothesis. Obes Rev. 2005 May;6(2):133-42. http://pmid.us/15836464. That any increase in total calorie consumption leads to weight gain which induces insulin resistance in the liver, which in turn upregulates gluconeogenesis. Contrariwise, any decrease in calorie consumption reverses insulin resistance in the liver and downregulates gluconeogenesis. That the loss of protein associated with gluconeogenesis is treated by the brain’s appetite control centers exactly the same as a decreased intake of protein, and therefore that ongoing gluconeogenesis increases appetite immensely. The theory of obesity is that once someone starts eating a low-protein diet, their appetite goes up. So they eat a larger amount of total calories, and gain weight. The weight gain causes them to become insulin resistant in the liver. Once that occurs gluconeogenesis is no longer inhibited by insulin, and the liver converts protein to glucose willy-nilly. The loss of protein stimulates appetite. But the person has to eat a lot of excess calories to get enough protein to replace the protein lost in gluconeogenesis. So weight goes up even more. There is a vicious spiral. Weight would be unstable. Weight would spiral out of control upward if people ate low-protein diets, and people would wither away once they started eating high-protein diets. Low-carb diets would be extremely obesogenic. Every 1 calorie reduction in carb intake below the body’s daily needs of 600 calories would induce the eating of an extra 1 calorie of protein for purposes of gluconeoegenesis, and on the order of 4 extra calories of fat (by the leverage hypothesis: the P:F ratio stays constant). So each reduction of carb intake by 1 calorie leads to an extra ~5 P+F calories and an increase in total energy intake of 4 calories. Zero-carb diets would induce ravenous appetite, consumption of an extra 3,000 calories per day above the amount needed for weight stability, and obesity and metabolic syndrome would rapidly follow.